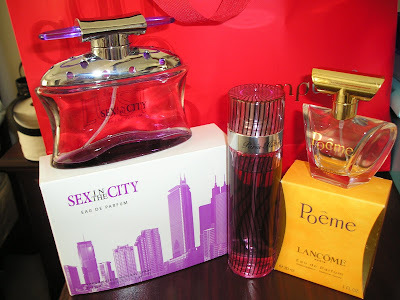 Honestly, I don't like make up but I am crazy about perfume. I gotta have a spray of perfume before I go out the house. It's not only the scent that I consider when buying a perfume but also the shape of the bottles because I collect them (weird eh?) If you will see my collection of empty bottles of perfume in WV, you might say "This woman is nuts" lol. My husband used to give sets of the Victoria Secret collection, I love the scent and the bottles are beautiful. During our short stay here in Korea, here's the one I got. Share us with your favorite perfume, just click the badge above to join. We made BBQ Ribs yesterday and I made the marinade sauce very thick and yummy so I decided to keep it in the fridge instead of throwing it out. Well, I used the same marinade today and it turned out really well too. I baked it this time so its different from yesterday's grilled BBQ. I already boiled the meat with the marinating sauce so I only baked it with the bell pepper for twenty minutes. My husband and I ate our BBQ with rice and kimchi. Here are our angels in action.. I was surprised that our son ate because he is not very fond of eating meat... But look at him! Here's Rylie's last bite.. BURP! What did you have for lunch today?